The twenty-five laps of race one at the tight Moscow raceway saw Chaz Davies make a great start to lead from turn one. The same could not be said of Carlos Checa however, who was taken out on only the second corner by Cluzel running alongside him. Indeed, it was an expensive first lap for several riders as Savadori and Iannuzzo also failed to complete a single circuit. This was always going to be a hard start for the rookie polesitter Giugliano and it proved to be just that as he also succumbed to the mixed conditions in lap two; leaving the Goldbet BMWs of Davies and Melandri in first and second. By lap three, Davies had eked out a two second lead, whilst behind him Sykes made steady progress from his ninth place start to fourth. That was until lap four when the Englishman rapidly slowed, pulled into a run off area of the track and leapt off his bike just in time to see it gush oil from the left hand side and then spectacularly burst into flames. An already eventful and incident full race, became even more so as the white flags came out to finally warn of rain on lap seven. This did little to dampen the pace of Davies though, who was pushing hard out in front with a 2.8 second gap over second placed, BMW Motorrad teammate, Melandri. By lap ten the increasingly treacherous rain and wet track forced riders to slow and teams to consider making tyre changes; including the Pata Honda pair of Rea and Haslam and the remaining Fixi Crescent of Leon Camier. As the wet track began to take its toll, Guintoli and Sykes' Kawasaki KRT stablemate began to drop off the pace leaving the fresh tired Pata Honda’s to begin making full use of their freshly shod bikes. More drama came on lap sixteen as Eugene Laverty - looking to close the gap on championship leader Sykes - lost the rear on turn eight, being left to watch his Aprilia cartwheel across the gravel and his mechanics to begin a seemingly impossible job of making it operational for race two. Leon Haslam also came off at the same turn, complaining of ‘stupid conditions with one half of the track wet and the other completely dry’. It was indeed a race full of strange and crazy circumstance, but also one of brave tactical decisions as lap twenty-one saw Guintoli, Melandri and race leader Davies finally coming in to change into wet tyres. This reduced a nine second lead from the Welsh BMW man down to zero as both he, Melandri and Guintoli came out from the pits together. Loris Baz, keen to battle for first place - and perhaps to help his fellow Kawasaki rider reduce the points on his nearest competitors - stayed out on slick tyres in the increasingly wet conditions however. But it was a fruitless decision as Melandri - already having overtaken Davies post pitstop - slipped past on his new tyres to take the lead with just three laps remaining. A BMW GoldBet one-two - albeit in a reversed order than that of the majority of the race - saw Melandri take victory from Davies and the first Ducati on a podium for this season of Badovini in third. 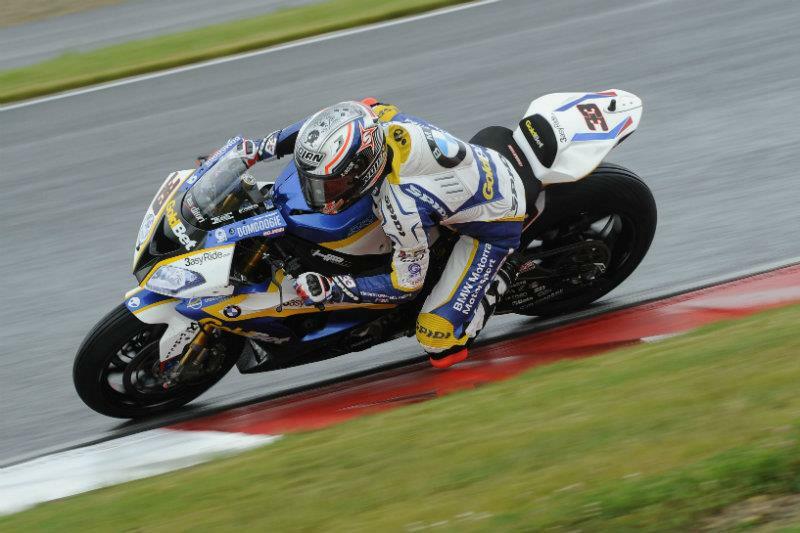 Sylvain Guintoli takes back the championship lead by virtue of just managing to finish the race in sixth.